Abstract: Writings, photographs, and a scrapbook related to Julianne Kelly, one of the 35 Syracuse University students killed in the bombing of Pan Am Flight 103 over Lockerbie, Scotland. 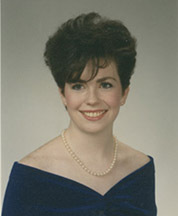 Julianne Frances Kelly (1968-1988) was among the 270 victims of the bombing of Pan Am Flight 103 over Lockerbie, Scotland on December 21, 1988. She was returning from a semester abroad in London to her home in Dedham, Massachusetts to spend Christmas with her mother, Rita, and two sisters, Mary Ellen and Janice. Her father, Thomas, had died in 1982. Pursuing a double major in political science and public relations, Julianne was a junior in the S.I. Newhouse School of Public Communications at Syracuse University. streetlight then was lost in soft darkness. The Julianne Frances Kelly Collection contains Writings, copies of Photographs, and a copy of a Scrapbook related to Julianne Kelly, one of the 35 Syracuse University students killed in the bombing of Pan Am Flight 103 over Lockerbie, Scotland. Materials have been donated to this collection by staff of Syracuse University, and Julianne's friend, Carrie Warwick (nèe Dash). The scrapbook contains materials related to the Syracuse Chapter of Pi Beta Phi Fraternity for Women, of which Julianne and Carrie were charter members. A significant portion of this collection consists of reproductions of original material held by the donor. Several photographs from this collection are also available as digital files. Please contact the archivist for further information on accessing the materials. Through These Eyes: The Poetry and Prose of Julianne Kelly. Carrie Warwick donated the Julianne Frances Kelly Collection in 2013. Syracuse University staff donated additional materials. The Julianne Frances Kelly Collection is fully processed. This collection consists primarily of reproductions. The originals remain with the donor.